This has definitely been a full weekend. With sunny days and high temperatures around 80F/26C, I had to get outside and take advantage of it. Saturday I worked outside several hours cleaning up the dead stalks from last year’s perennials. I have two more beds in the front of the house yet to do. This always takes so much longer than I expect it to and the compost bin is overflowing. But everything is looking great. The black currant has leaves and so does the gooseberry which also is getting tiny little flowers on it. 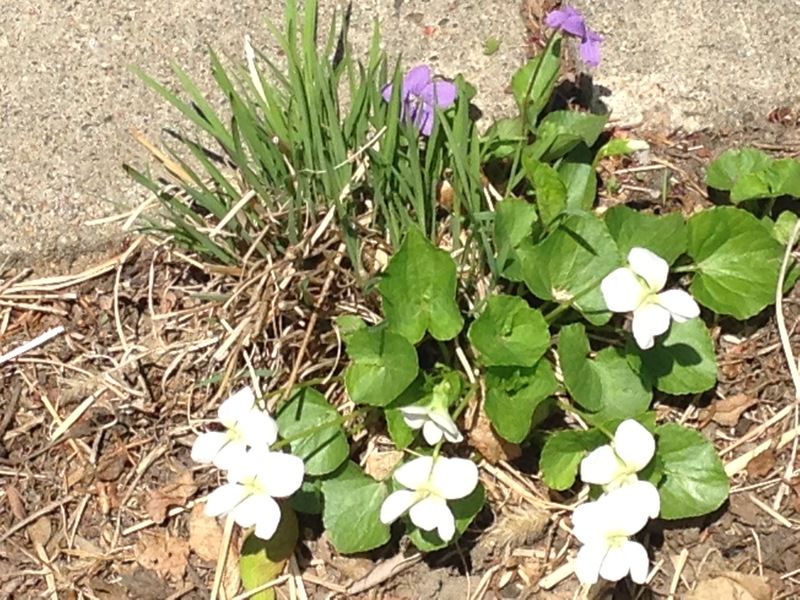 And those wonderful violets that no one ever plants but seem to pop up everywhere are, well, everywhere and blooming mostly white but a few purple too. The tulips are open now as well and one of them has already been beheaded by a naughty squirrel. At least it is only one. The squirrels have ripped off the heads of all of them in one go before. In the veggie garden the radishes are coming in strong. I am so looking forward to radishes. Last year I discovered how good they were sliced up on sandwiches and I’ve been craving them since the seeds arrived in the mail in January. Another three weeks and I can feed my craving. Last night Bookman and I planted more peas. We also planted mustard, kale and spinach. Bookman has been on a spinach kick lately so we planted a lot of spinach. We also planted a lot of kale because I love kale and I found a recipe for garlicky kale salad with crispy chickpeas last month that I am yearning to try. I can tell it’s spring because I am craving mounds of leafy greens. In the winter our greens have to come from somewhere else and that somewhere is California. But with the worst drought they have seen in decades, the greens have been rather small and sad and I have felt very guilty even eating them. So hopefully in a few weeks I will be able to start eating fresh greens from as local as my own garden. The French sorrel in the herb spiral is just sprouting up but there is a common sorrel that seeded itself from somewhere next to the defunct Amy Pond that is already tall and leafy. I am planning on pulling off a leaf or two to have on my black bean burger this evening at dinner. Yum. blossoms are lightly and pleasantly scented. The bush cherries are also blooming. This year I will be sure to put netting over them so I can actually try the little cherries! 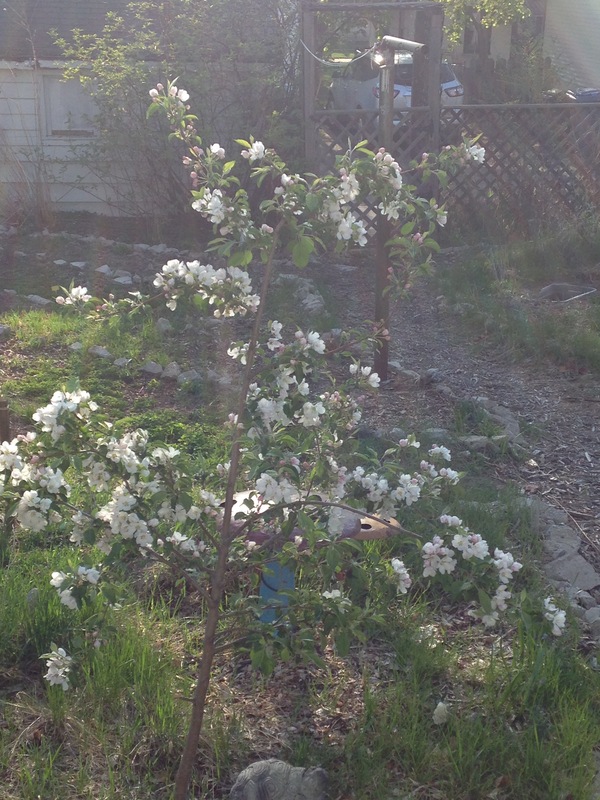 My nextdoor neighbor’s tart cherry tree is also in bloom. They don’t pick the cherries because they have to be pitted and cooked and they think that is just too much work. Bookman and I do not feel the same way, however, and they let us pick as many as we want. Last year there were hardly any cherries and the ones that did come on were really small so we didn’t bother. It is not looking like it will be good this year either. Several branches of the tree are completely bare. Depending on how things turn out in the chicken garden, I might have to seriously consider planting my own cherry tree because sweet or tart, do I ever love cherries! We are expecting thunderstorms later this evening, but if I have the get up and go after dinner I will spend a bit of time in the garden planting arugula. I might not have the energy though because of all the bike riding I have been doing this weekend. Yesterday I did 34 miles/54.7 km indoors on the trainer and early this morning Bookman and I went out on our bikes and rode 35.7 miles/57.4 km. It was a beautiful ride, sunny and the perfect temperature. Our only snafu was getting caught passing through the Walk for MS crowd. We did not know the walk was today and there were so many people! They were totally oblivious about all the cyclists who were out and, like us, got stuck in their traffic. But since Bookman has multiple sclerosis we really appreciated seeing so many people and thanked many of the groups we passed for walking. Look fast before the squirrels behead them! We are doing so well with our biking that we are considering doing the train and trail tour in June, a 45 mile/72.4km ride that involves taking the Northstar Commuter rail train north and outside of town and then cycling back. Doesn’t that seem like it would be lots of fun? We will have to decide soon if we want to do it because the ride is limited to 150 participants. I suppose even on a Sunday they don’t want to have hundreds of people and their bikes crowding onto the train, which probably has a capacity limit. Will we go? Stay tuned! I have a lovely short week at work ahead because this Friday is the Friends School Plant Sale! Think of the biggest book sale you have ever been to, then imagine you are a gardener and the books are plants. That’s what this is like. And just like book people are generally very friendly, so too are gardeners. But when there is a sale, all bets are off and woe to anyone who gets in the way of the object of desire. I finalized my plant list just this afternoon. I am ready! Of course I will tell you all about it. 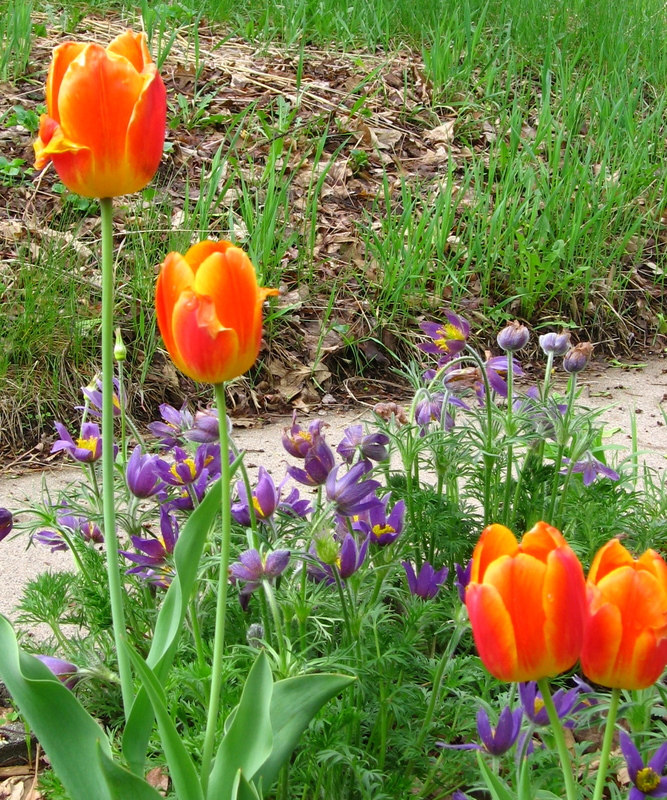 Great photos, I love your tulips and how I wish I could join you at that plant sale – sharpen your elbows! I’m amazed at the distances you are both cycling already. Wow, your weather was warmer than ours! It was also a lovely weekend here in Savannah and I was happy to spend some time on yard cleanup and talking to the plants in the raised bed. The pink amaryllis is finally showing some signs of life. And the Cosmos have developed the first “true leaves” so there’s hope it may bloom even in my heavy shade. And the beans! I should be able to harvest beans in another couple of weeks. I can’t believe how fast and how well they’ve grown. I need to plant a second batch next weekend. The Nasturtium isn’t sure what it wants to do,but if it doesn’t show signs of blooming soon, I’m going to start picking the leaves for salad. Your garden photos look fabulous and I envy you the plant sale. Tulips abound over here too. Inside I mean, left over from the festivities of last week. And daffodils. And roses. 26 C. Much warmer than with us too, we had a good 15 C. Sunny and dry which is good. Enjoy your plant sale! Cath, oh it must be lovely! I have one tulip flower left. The daffodils are not blooming yet but soon I think. You’ve got roses blooming? Wow! We are a month or more away from roses. of course — YAY for you! I do enjoy your updates! Care, oh no! Don’t give up on your garden! It is lots of trial and error and perhaps the extension folks can give you some ideas. Good luck! some creature must have got to our tulips because not a single one flowered this year. Daffodils put up a good show though. What do you do with yours when they die – just let them die back in situ or move to another part of the garden? BookerTalk, oh no! Depending on what sort of tulips you have they may have just reached then end of their flowering life. Whenever I plant parrot tulips for instance I can only count on them flowering for 3-5 years. After that they still come up but they never produce anymore flowers. My daffodils are being slow this year, but after they flower I just leave them be. I mix bulbs and perennials so that the waning bulbs get covered over by the growing perennials.